LeEco (formally known as LeTv) Le1s is a newly launched mid-ranger who is all set to compete with other recently launched budget phone Lenovo K4 Note. Both phones come with top end specification with an affordable price range. So we decided to compare Lenovo k4 note and le1s. LeEco has launched two smartphones including budget friendly Le1s in India earlier this week. This budget smartphone sports a 5.5-inch FHD IPS display with 1080p resolution. Le1s powered by 2.2 GHz octa-core MediaTek Helio X10 chipset with 3GB of RAM and 32GB internal storage. The phone comes with 13 MP rear and 5 MP front camera and 3000 mAh battery. The Le1s is available exclusively on flipkart.com via the flash sale. 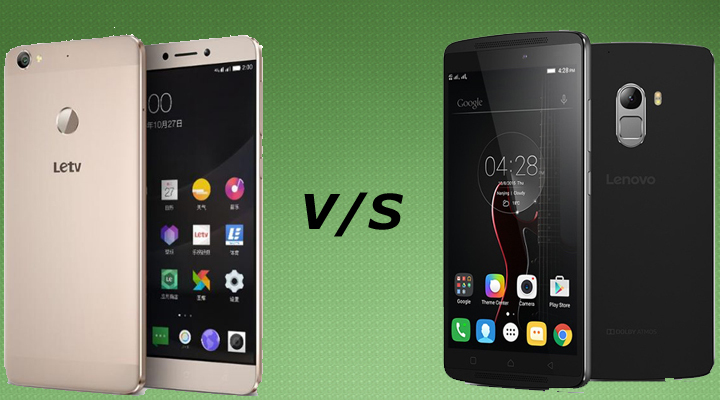 Below is the detailed comparison between LeEco Le1s vs Lenovo K4 Note. On other hands, Lenovo K4 note a K3 Note successor comes with octa-core MediaTek MT 6753 processor with 3GB RAM and 16GB internal memory. Lenovo K4 Note also comes with a 5.5-inch FHD IPS display and 13MP back and with the front camera of 5MP. The K4 Note is available exclusively on Amazon.in via the flash sale. Both of these phones comes with an almost same specification, so we decided to compare both of these to see which one is better. First we have to examine different segments, and then we moved to the detailed comparison table. Also, check comparison between Mi4 vs Oneplus X. Display and Design: – On the display front, both K4 Note and Le1s comes with a 5.5-inch 1080p Full HD display (1080x1920p resolution), with Corning Gorilla Glass 3 protection. The Le 1s has a 500 nits display which is brighter than k4 note 450 nits display. Le1s looks more premium with its all metal unibody and bezel-less display then K4 Note, which has a curved plastic build with a curved metallic frame. Processor: – The Le1s is one step ahead of k4 note concerning processor with a powerful 2.2 GHz octa-core MediaTek Helio X10 chipset. K4 Note features a 64-bit MediaTek MT6753 Octa-Core Processor. Both Phones came with a powerful GPU and packed with 3GB of RAM. OS: – The LeEco Le 1s runs the company’s EUI (based on Android 5.0.2 Lollipop) with a promised upgrade to Marshmallow quiet soon. Lenovo K4 Note runs on company’s Vibe UI (based on Android 5.1). Lenovo k4 note also gets marshmallow in near future. Memory: – Both smartphones comes with a 3GB of RAM which gives you a powerful and lag free experience. If looking at internal storage, Le1s comes with a 32GB of internal storage with no option of external card slot whereas K4 Note comes with 16GB internal with an option of expandable memory up to 128 GB via microSD card. Camera: – On the photography front, both smartphones features 13MP camera on the back with autofocus and led flash and a 5MP camera on the front. Le1s also has Phase Detect Auto Focus sensor, slo-mo video recording and 4K video recording. Battery: – The K4 Note has slightly bigger 3,300mAh battery than Le1s, which has a 3,000mAh battery. Le1s comes with a fast charging feature which claims that 5 min of charging is enough for 3.5 hours of usage also it comes with a USB Type-C cable. Price: – The most important factor when someone looking for a new phone is the price of the phone. Le1s comes with a price tag of Rs. 10,999/- and available exclusively on Flipkart while K4 Note comes with Rs. 11,999/- and available only from Amazon. Additional Features: – As for connectivity, both smartphones has dual SIM slots and 4G support. And yes Lenovo k4 note has dual sim and also support microSD card (not the hybrid one where you can use either one sim or sd card). Additionally, Lenovo K4 Note comes with a TheatreMax technology which comes with the ANTVR headset. Le 1S also got a similar combination with its 3D Helmet. Both phones come with a fingerprint scanner. Verdict: – On paper, both smartphones perform well in all department and has an almost same specification. But LeEco Le1s has better processor then K4 Note. Also, Le1s got an advantage of the low price tag, fast charging, more internal memory and 4k video recording. On other hands, K4 note had a slightly bigger battery, NFC and microSD card support. This is the full comparison of LeEco Le1s vs Lenovo K4 Note. Now the choice is your, let us know which one you choose LeEco Le1s or Lenovo K4 Note by comments below.